Staffordshire Surfacing operates from our office and yard on Parkhouse Industrial Estate in Newcastle-under-Lyme. Most of our work is carried out within a 50-mile radius by our directly employed local workforce. Staffordshire Surfacing was formed in 2014 within Keble Heath Construction to build upon our reputation for providing a quality finished product, delivered by our well trained experienced workforce. Health and safety is treated with paramount importance. All our contracts are visited daily by senior staff members, rather than just relying on infrequent policing visits from external advisors. Our Health and Safety Policy and implementation are overseen by our NEBOSH accredited Contracts Manager, backed by our local H&S advisors APT. We are members of CHAS, Constructionline and CITB all of which demand high levels of Safety Management with a commitment to continual improvement and sustainability. Furthermore, most of our operatives carry Streetworks qualifications, CPCS and CSCS cards, all of which promote safety awareness. 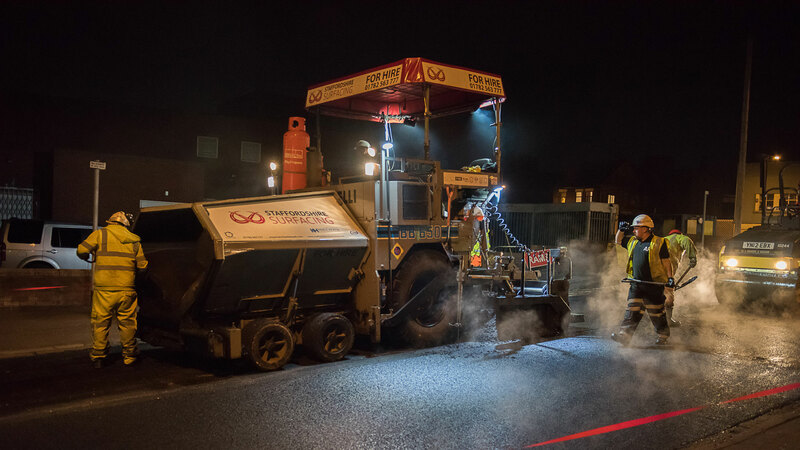 Staffordshire Surfacing have been working with us on our Stoke Highways Framework Contract for the last 3 years. During this time they have become a valued member of our supply chain, delivering high quality surfacing on highways, footpaths, playgrounds and car parks within Stoke on Trent. We have found them trustworthy, flexible, co-operative and able to work to our strict Health, Safety and Environmental procedures.